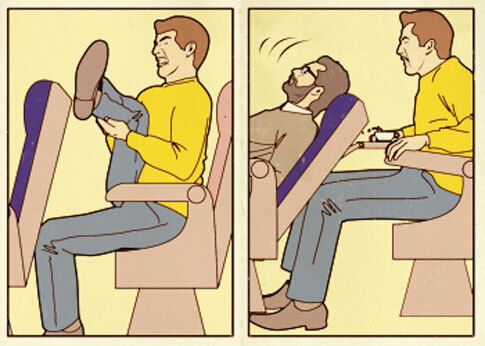 The courteous person will choose to not recline their seat for the entire duration of the flight. ... [But] I do think that the person who, unfortunately, has the seat coming back into their lap has to get over the fact that that's just the reality of the situation. A comment made in the ensuing conversation stuck with me, something about there being no moral requirement that an individual sacrifice personal comfort for the sake of someone else's comfort - the implication being that one may recline at will and be free of any responsibility for said reclining's affect on those seated behind you. Interesting. Does this comment provide any insight into how societies treat each other in the global community? What I'm wondering is if individual actions "trickle up" through our local, regional, and national elected officials to be made manifest in our international relationships. If we're OK with this, do we elect people that are OK with it too? What I'm getting at is the thought that we're collectively responsible for the well-being of those that share our global community through our individual actions reflected in the actions of the societies we inhabit. Is this far too simplistic a conclusion? For me, the key portion of Ms. Posts comment above rests in the word courteous (connecting to the comment about shared responsibility & moral responsibility). Perhaps my simplistic conclusion that the lack of courtesy displayed in small daily interactions leads to a lack of inter-societal courtesy may be reversed by heeding Ms. Post's admonition; those less privileged need not be saddled with a global seat back in their face. So, going back to my question, is there a shared responsibility for "comfortable" societies to forgo some of those comforts for the sake of others? Perhaps something as simple as an International Call for Courtesy between people and Nations is required (how naive is that?!). How about we change our Facebook avatars to include Emily Post's Blue Book of Etiquette (or something) in the background and open doors for people, wave people into traffic, and perform other random acts of courtesy for a week (hopefully longer) and share the stories in our feeds. It is The Holidays after all. What would that accomplish? Would it "trickle up" through communities and governments in a few years? Would it end up as another in a long line of slacktivist acts?